The moment I was informed by the people from Season Of Mist that the tour for the promotion of "Ordo Ad Chao" would take place in the absence of a tour manager, I envisioned my chances of doing an interview with Mayhem's axeman Blasphemer slowly fading away. With a stroke of luck only to be found in the movies, I managed to find myself in the backstage area of the Islington Academy where, on the evening of the 21st of February 2008, I conducted what can be described one of my most pleasurable interviews to date. With disarming honesty, the main composer of Mayhem described the experience that led to the creation of Mayhem's last opus, his unique musical relationship with vocalist/legend Attila Csihar and explained why none of you should be really surprised if you were to see...Bugs Bunny on stage during a Mayhem show! Hi there, Blasphemer - I finally managed to find you. That was not easy, especially in the absence of a tour manager. By the way, why have you chosen not to employ one for this current tour? Blasphemer: That is a long and very complicated story - better not go there (laughs). I am really happy to be doing this interview with you because I found "Ordo Ad Chao" to be as exciting and as impressive as "Grand Declaration Of War" - an album that I simply adore, much to the dismay of many of our subscribers and Black Metal fans alike. Let's start by me congratulating you for the recently acquired your native Spellemann award of "Best Metal Album" for "Ordo Ad Chao". You must be particularly pleased as the composer of the album. Blasphemer: Ahhh...I guess that I should say yes, but not really because these things...I don't want to sound arrogant but I don't really need anyone to tell me that I wrote a good composition when I already know that for myself. It is enough for me to know that I have achieved it - I don't really need people to give me trophies to put on my walls. It is good because it has boosted our album sales again at it will hopefully make those people who decided to write off "Ordo Ad Chao" in the first place to try listening to the album once again and maybe even change their minds. There is definitely something good about this release; still I was quite surprised to find out that we won the award. Having said that, though, I kind of had a feeling that we would win the award this year, especially after I found out that we were nominated for it. I though "this is now or never" for us and it looks like I was right. It doesn't mean that much for me simply because I do what I do for myself - I don't need a guy who is sitting in an office in Oslo to tell me that I have achieved something musically. Do correct me if I am wrong here, but you have been the sole composer of Mayhem material since the days of "Wolf's Lair Abyss". I never understood the reasons behind that. Blasphemer: ...exactly (laughs). I have always been very determined, I always knew what I wanted to hear and when I know that I can make things work I do everything in my power to achieve that result. I have the tools around me that help towards that goal and I also happen to be the guitar player, which is the person that will eventually come up with the riffs. As soon as I came into the band and we did "Wolf's Lair Abyss", this 'rebellious' thing that we have released, I started to have more input into what was happening, I blocked everything out and it helped the fact that the other guys trusted me to do it. The whole thing happened very naturally - as I said, it's in my nature to do this seeing as I am a very creative person. Blasphemer: Thank you. Yes, so far, so good. They normally like my ideas but of course there are times when I come up with something weird and they all go "what the fu*k is this" - they don't just think about it but they also say it out loud (laughs). They were a bit sceptic with "Grand Declaration Of War" and same was with "Ordo Ad Chao" but they do know that everything that happens is as a result of a certain plan - nothing happens randomly, even though it seems like this is the case sometimes. The only thing that happens in that respect is the process we follow in the studio and that is due to my use of overdubs and the creation of different layers of music for each composition. That pretty much depends on how I feel at each given moment. The skeleton of each song is tightly connected and well thought through, based on a specific plan. Allow me to drift through a little bit and make a connection between "Grand Declaration Of War" and "Into The Pandemonium". In Celtic Frost's case, it took ten years before people finally accepted and respected the innovative nature of this album. Maybe "Grand Declaration Of War" needs to undergo a similar stage of 'maturity' in the consciousness of Black Metal fans. Blasphemer: People are just happy to follow every trend that is dictated to them. We are aware of that and we are also aware that some of the things that we do will not become accepted straight away. Strangely enough, "Ordo Ad Chao" was more or less accepted straight away by the so-called 'elite' of our fans. They embraced it, much to my surprise, seeing as this album was completely over the top. We held nothing back. We released everything out of our systems and there are no musical rules whatsoever in that album. Having said that, the title "Ordo Ad Chao" sounds more relevant to me than ever before! Blasphemer: That was exactly the point we were trying to make. I don't want to sound snobbish but there is not much music, especially in Black Metal, that I find appealing nowadays - music that I feel has a certain 'mission'. I almost get pissed off every time I put a Black Metal on because most bands try to play things that everybody else did back in the early 90s. Who cares about that stuff, you know? These are some of the reasons why I amazed to see "Ordo Ad Chao" receiving the response that it did. Sometimes we feel as if we're in the 'twilight zone' or something similar to that (laughs). Although "Grand Declaration Of War" is a harder 'nut to crack', I believe that the same 'rules' applied for that album. For me "Grand Declaration Of War" sits on one side of our musical spectrum, "Ordo Ad Chao" sits on the exact opposite and "Chimera" is somewhere in the middle. "Chimera" can only be described as a 'non-sane' album for me because I felt like cleaning my musical 'closet' when creating it. That was important in allowing me to maintain Mayhem as a band - it was not a ground breaking release in any respect, but it helped us continue breathing what it is that we breathe in order to allow us to still exist as a band. It was a decent release and very purposely good as well. It was what I would describe as the 'calm before the storm'. Blasphemer, one more clarification for us, if you may. Necrobutcher has been credited as having recorded the bass tunes on "Ordo Ad Chao" but I am sure that I read somewhere that it was actually you that performed such duties. Is that indeed the case and if yes, why? Blasphemer: Well, I understand that such things can be quite confusing but this is not really a big deal seeing as things like that happen to bands all the time. In this specific case we had to create an album that included many different tones and constant changes in rhythm, the creation of a real mess if you choose, plus most of the parts were finished in the chair of the recording studio - what you could describe, I suppose, as the final nail in the coffin. We made, of course, plenty of rehearsals for this album but not the complete versions of each song, seeing as each composition continued to evolve in my head during those rehearsals, so instead of having to 'teach' everything to Nercrobutcher in a short period of time, we decided to follow the easy way out which included me recording the bass guitar. I wasn't really trying to make anything out of this - it's just that this decision of yours looked slightly weird! Blasphemer: Yes, I can see why that is (laughs). Necrobutcher did record a few parts, though, on "Ordo Ad Chao". How would you describe your working relationship with Attila Csihar - the guy whose vocals can be heard in the classic "De Mysteriis Dom Sathanas". Would you, in retrospect, describe the whole process of creating an album with him as limiting or liberating? 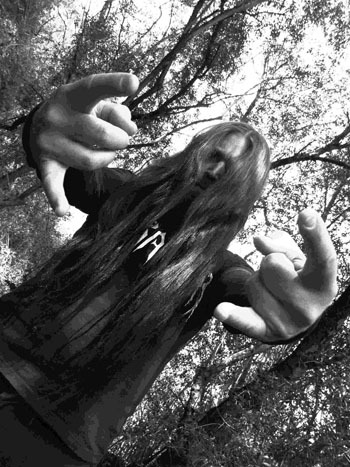 Blasphemer: I understand that what I am going to say will shock quite a few people but I knew that having him back in the band will finally provide me with the opportunity to push "De Mysteriis Dom Sathanas" off the shelves (laughs). A lot of people will not agree with what I just said but I really don't care. My opinion is that "Ordo Ad Chao" is a darker album than "De Mysteriis Dom Sathanas". Of course, having said that, "De Mysteriis Dom Sathanas" is the milestone that it is because it started something back in the early 90s and that cannot be taken away from it, but all the dark and fu*ked up elements that can be found in "Ordo Ad Chao" make it a deeper and darker album in comparison. As soon as I got Attila back in the band, I knew that I could challenge things, get further and deeper in terms of feeling than ever before. So, to answer your question, I believe that it was indeed quite a liberating experience working with him. Attila is a very talented person and we managed to connect immediately, seeing as we share the same kind of fu*ked up ideas. It was a pleasure because I felt that I finally found someone who could match me and work with me. "Grand Declaration of War" was a product of the collaboration between Maniac (ex vocalist) and myself but with "Chimera" it was more a case of me dictating how things should happen. Maniac was totally fu*ked up during that period, arriving at the studio totally drunk with no intention of rehearsing. I actually had to indicate to him which parts he was to sing and even how to sing. Now, I finally managed to find my counterpart - a colleague that can also push my creative limits. It was not a case of me sitting on my chair and dictating how things should happen - we were sitting opposite each other, on equal chairs, exchanging ideas back and forth and in doing so expanded the vision of this album. For me, working with Attila was a great pleasure. We both knew from the very beginning that we were not going to do another "De Mysteriis...", seeing as this album was recorded back in the 90s and there was no point in trying to recreate a similar atmosphere. Attila was also very young when that album was recorded and has created many different things since then. So, I told him from the very beginning that I knew what people were expecting but that they were not going to get it, mainly because I am really keen on retaining my integrity as an artist, and he totally agreed with me. That's when we started working on all these crazy ideas. We really felt like we managed to hit a certain nerve that went against everything, you know, so we really moved deep towards that new direction. I remember the rehearsals at the time being really hard to the point that I was feeling really uncomfortable with the whole situation. Attila was drinking a lot at the time because we all felt really depressed after each rehearsal when we had to go home. When you have to deal with sounds that are not 'suited' to you, the result really affects you - music really affects you in that respect. You understand, of course, the 'reaction' that happens when our music meets with the natural flow of things - we all became slightly depressed, having a really hard time to cope with things. You almost felt the presence of a 'black cloud' - one that was approaching further down towards you. We decided to stay focused while the recordings took place, not only for the sake of the record, but also in order to retain that dark feeling that surrounded us at the time. I am the one, of course, that creates the music, but this album would definitely not have sounded the way it did had Attila not been part of the picture. He pushed me, I pushed him and "Ordo Ad Chao" became the result of this great collaboration. I really enjoy reading reviews of Mayhem albums because I normally tend to find the use there of some really interesting adjectives such as "unorthodox" (I laugh). To me, it feels that people treat your releases either with fear or respect. Putting the fans aside for a minute, did you find the reaction of the music press to be a positive one - not that you should really care! Blasphemer: (laughs). Not to confuse you with what I mentioned in the beginning of this interview, but I do pay attention to the reviews that are written and it is always cool to get great reviews - we are not that 'anti-everything' (laughs). I was really happy to see that people did manage to 'click' on the album and that we had coverage even in more 'mainstream' magazines. Then, all of a sudden "Ordo Ad Chao" began to feature amongst many people's 'best album' lists and that culminated in us winning the Spellemann Awards in Norway. I remember thinking "what the fu*k - did they even listen to the album?" (laughs). I mean, if you listen to it, it will definitely drag you down, so how come did we end up winning an award for it - for an album that releases total negativity? That is very interesting indeed. I also like the fact that things are not deemed to be over yet in terms of the positive reaction that the album has received. There are still people that are getting into the album as we speak, maybe because there were so many people that thought that "Ordo Ad Chao" was really cool but didn't really know what they were talking about, having not really understood what it stands for. There are also a few people who believe that this album is a piece of sh*t because of the sound and the overall production - opinions which I have read in a few reviews. ...and believe me when I say that you could not have said anything that could make me feel happier than I do now! To me, at least, there is a certain sense of coherence between the compositions that put together "Ordo Ad Chao" - a feeling that I normally tend to find in concept albums. Is "Ordo Ad Chao" a concept release in either the loose or strict sense of the term? Blasphemer: The intention behind "Ordo Ad Chao" is such that I guess you can treat it as a concept album. All the songs came out with a similar intention in mind, and so they are connected in a certain way. Yeah, there is something that you cannot really define but which certainly brings each song closer together. Blasphemer: Exactly right. This can also be attributed to the production that we made for the album, which was deliberately created in the way it was. This makes also sense in the translation of the album title "Ordo Ad Chao", following a path towards chaos and that is as far as we can draw parallels with a concept in mind. I also did a few things deliberately in the album in order to enhance that feeling. The closing riff of "Wall Of Water" for instance sounds exactly like the opening theme of "Great Works Of Ages" which then follows. I knew at the time that this is how things should be. True, still it is not just riffs that create such a sense of coherence, but also many background sounds or vocal themes that work towards such a result. Blasphemer: Yes, exactly. The result is 100% solid - no water 'leaking', you know what I mean? Do you feel that any of the songs that are featured in "Ordo Ad Chao" have what it takes to be treated as Mayhem classics one day? For me "Illuminate Eliminate" is a great example of a composition that deserves such credit. Blasphemer: I believe that this could be indeed the case some day. There is something about these songs all of which drew much strength from me, both physical and mental in order to create. We created something that cannot be described as 'worldly' so I want to believe that these 'beastly children' of mine will manage to live for a long time (laughs). I cannot, of course, say whether they will be able to one day compete with classics such as "Freezing Moon" seeing as that is not really for me to decide. I guess that we will both have to wait and see what happens (laughs). In relation to live performances, have many things have changed now that Attila is behind the microphone? Are we to expect something special/different tonight? Blasphemer: I believe that we have also gone over the top with the way we come across in a live environment now that Attila is back. We have a certain understanding between us when it comes to things like that and Attila and I are capable of spending hours over the phone talking about things like that in order to decide what to do. Things are really well thought through with regards to live performances and not simply a case of us plugging our guitars and going on stage. In order to appear the way we do on stage, we have already spent several hours talking about it beforehand (laughs). Have you heard anything about the costumes that we have been using lately on stage? Blasphemer: Oh, that's great then that you ask me this thing because I can definitely tell you that you will be very surprised by tonight's show and I don't know if you are going to like it, but our job is not to find out either (laughs). If you like it, you like it - if you don't, you don't! I am spellbound - cannot wait for the show to begin! Blasphemer: We have made a series of shows till now which can be described as 'over the edge' seeing as we are constantly trying to test people's limitations with what we present on stage and with their view of what they should expect to see from us. We are trying to challenge people's perception of what Black Metal really is. Is it the whole make up thing, is it the environment? We like to push things in that respect so as to see how people will react - especially when promoting an album such as "Ordo Ad Chao" which is so...'unorthodox' (laughs). This is not a regular release in any shape or form and what we try to do is paint images and vision on stage so as to give justice to this material and also to ensure that you will go home having endured a really bad nightmare (laughs). This will either be the most unique or the worst thing that you have ever seen. Anyway, to answer your question and seeing as it is really not a huge secret anyway, what has been happening is that Attila has been playing many different characters on stage, some of which have been completely over the top. Blasphemer:...believe me, it gets much weirder!. This thing kind of kicked something in me also because, to be entirely honest, things were starting to become too monotonous on stage for me. We need challenges - people need challenges and should embrace them...anyway, that show kick-started everything. (note: at this point there was a break of two minutes when both I and Blasphemer suffered from uncontrollable laughter, after which we finally managed to find the strength required to finish this interview). Blasphemer (continues): ...it is funny but it also creates a very strange environment as people tend to stare with their mouth open while we continue playing this really bad music (laughs). That was completely over the top and indeed left quite a few people with a question such as "what the fu*k is going on here"...believe me - it was really priceless to see people's face during that show. They were expecting something very specific, especially after heaving heard an intro that was building a certain tension...most people didn't know whether they should laugh or cry and I believe that we experienced both that night (laughs). One of the best characters that Attila ever used was that of the French Chef, where we even had a table on stage, so I guess that you will agree with me when I say that we have something very special for you tonight. Blasphemer, one more question and I will let you go. Most of the people I know who were informed of this upcoming interview have asked whether there were any plans for releasing a DVD with Attila behind the microphone - what is your response to that? Blasphemer: It's definitely part of our plans to record a DVD, but this will have to be a special release - not just another sh*ty DVD. Our intention is to make it be a statement of what Mayhem stand for in the year 2008. It is still quite 'loose' as a concept, but it is definitely there somewhere. We will simply have to find the right location, which, under the right circumstances, will make this an unforgettable DVD - a release that will be as good as "Ordo Ad Chao". Blasphemer, it's been a real pleasure talking to you - I hope that you enjoy tonight's show! Blasphemer: Thank you - likewise!